In preparation for Zgard review, and being not at all familiar with this Ukrainian one-man bad, I tried to do some research and stumbled upon the review of Zgard’s debut Spirit of Carpathian Sunsets, which was somewhat critical for the band being light on metal and heavy on folk meanderings. For those who were disapproving of Zgard’s lack of metal, you need to worry not anymore since Yaromisl has provided plenty of blackened character on Contemplation. In fact, if you only listen to snippets from the album instead of the whole thing, the first impression might be that all this newfound metal may not mesh completely with the profound, from the heart, folk. Thankfully, there is a replay button and soaring melody can be heard in Incarnation Memory next to its aggressive riffing, Wedge of Cranes starts with the raucous but the most familiar melody from my childhood and you can’t miss the melodic undercurrent of Through the Forest. The presence of sopilka and mouthharp still cause for Contemplation to be classified as folk infused “forest” metal, but more dangerous and on-edge jungle than enticing stroll in the park. You have to give the album a lot of credit for trying to provide a wide range of emotions and mental pictures. Wedge of Cranes embarks on the exalted village-wide festival. Amnesia, wrongly translated as Silence, is a quiet piece with an icy keyboard droplets and harp (or Ukrainian bandura?). Wind blowing at the beginning of Highlands and title track reminded me of ski trips to Ivano-Frankovsk and Carpathian mountains I took as a kid. 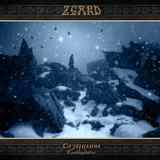 But then there are three tracks on the album, namely Highlands, Underworld Bells and the title track itself, where everything just comes together for Zgard. The feisty tremolo and higher pitched vocals complete the beautiful Gutsul melody, whether it is played using sopilka or more traditional instruments, on Highlands. The warring spirit crushes into introspective acoustic. The whole of the song proceeds on the desolation – contemplation – pride tangent and female laments just bring everything home. Underworld Bells indeed has bells, albeit synthetic sounding, until the pained intro melody becomes more grating, yet one can also hear abandon and dance. The final cherry on top is the title track, the embodiment of contemplation, unhurried symphonic, classical, yet emotionally withdrawn Bach clavier meshing with nature infused, arms outstretched warmth. This is balminess and comfort setting in just before body submits to hypothermia. Not all smooth, with rough edges and jerky transitions, not polished or meticulously produced, I felt Contemplation with my gut. Just like in older Khors albums, there is sereneness, quiet dignity and at the same time anguish and distress in Zgard’s latest offering. Whether you already visited Mount Goverla or only plan on doing so, the spirit of the Carpathian Mountains inhabitants comes through this album authentically. It isn’t only about the cover art looking the part.